What is the Shape Architect Body Wrap Therapy? The Shape Architect Body Wrap Therapy is the latest treatment available at Butterfly Effect Beauty Salon. It is a Body Wrap that can be applied with hot or cold wraps depending on your preference or goal. What conditions will this treatment help? The treatment can be applied to the whole body or selected parts thereof, excluding the bust area. A series of 8-12 treatments twice a week is recommended, then one treatment a month to sustain the effect. NOTE! Persons with varicose veins or dilated capillaries should not be subjected to “warm” treatment. This wonderful relaxing massage has a lot of the health benefits. 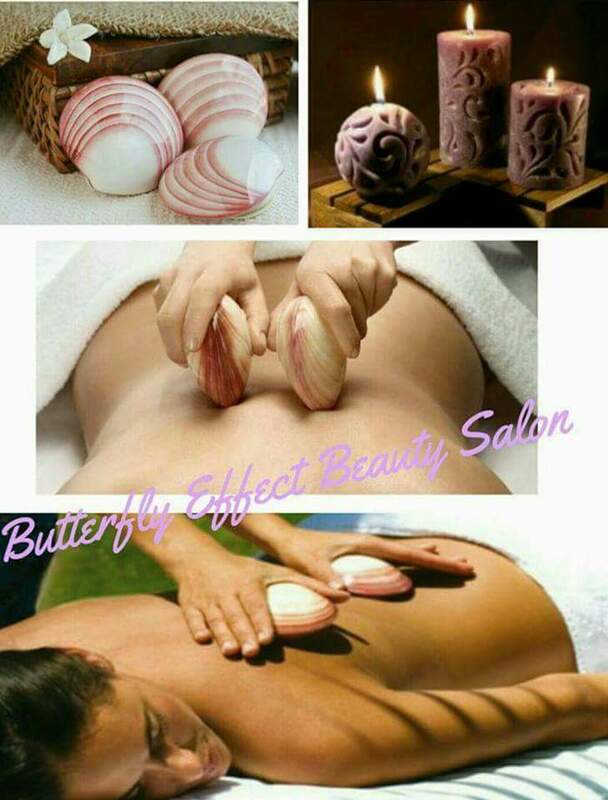 It is a warm massage,the heat is generated within the shells by inserting lava sachet and activator liquid. The real healing and soothing comes from the heat & shape of shells. If you have tense muscles, knot or injuries you are going to get a lot of the process. Another interesting fact is that the lava shells produce calcium ions when heated. Calcium has regenerating properties for skin. So this type of massage therapy can help firm up and repair your skin. A sugar scrub is the most popular body treatment at the spa. Its purpose is to exfoliate your skin, removing the outermost layer of dead skin cells and leaving your skin softer and smoother.